A top financial services provider engaged InStadium to assist in the activation of its National Hockey League sponsorship and, specifically, the promotion of its NHL-branded credit card. 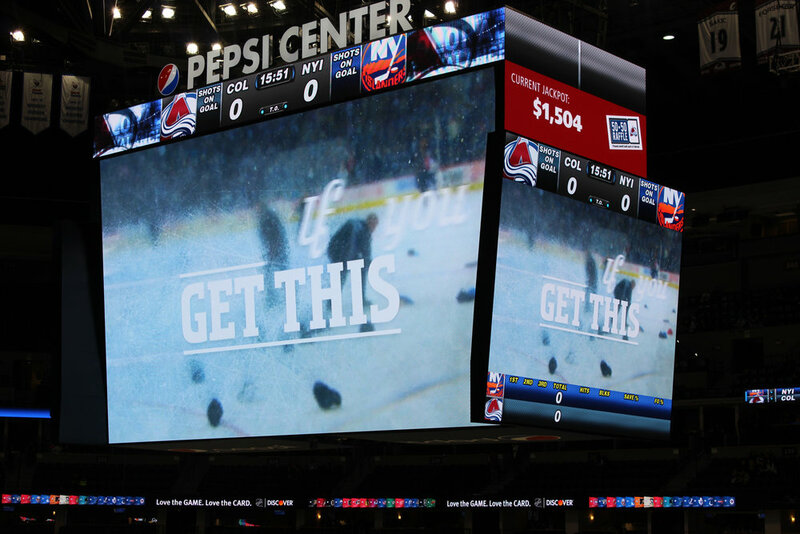 With a product tailored to appeal to NHL fans and commissioned by the league to support its brand, our client looked to InStadium for a partner who could connect with millions of hard-to-reach hockey consumers in their ideal environment: NHL arenas. Recognizing the value in direct-marketing to NHL customers in their element, our client tabbed InStadium to ensure that its campaign produced maximum impact. Our powerful live sports fan engagement platform included a show-stopping audio call to action, a can't-miss Jumbotron advertisement and supportive in-game LED and surround sound at every game, in every arena. InStadium customized a flight to maximize exposure and efficiently target our client's desired audience, delivering nearly twice the contracted impressions among adults 18 and over, as well as a brand presence that was voted most unique and impactful—three times greater than the nearest competitor's—in postgame surveys. A premier American auto company enlisted InStadium to assist in the activation of its Major League Baseball sponsorship. The goal: increase brand awareness, achieve positive consumer connection and strengthen an existing association with America's pastime. Building on our client's previous initiatives with MLB, InStadium customized a flight to connect with millions of baseball fans in the setting where those consumers are not only sure to be found but also be most receptive to our client's brand message: the ballpark. InStadium's live sports fan engagement platform—commanding audio directing fans' attention to a colossal screen featuring brand creative, plus supportive in-game LED and surround sound—delivered more than 10 million adult impressions for our client across more than 100 MLB and Minor League Baseball stadiums. Postgame consumer surveys revealed strong brand recall (particularly when compared to a control sample of television viewers) and shorter anticipated purchase times for new vehicles. A premiere financial services company required a partner to help strengthen its association with the NFL brand and build awareness in its “Make It Epic” marketing campaign. To move the needle among its desired audience, our client required unique expertise, assets and connections. InStadium's network of NFL venues enabled our client to choose a flight customized to its needs and reach its best customers in their ideal environment—game day at the stadium. Airing brand creative in this setting strategically aligned our client with the NFL brand, and InStadium's dynamic, larger-than-life media assets hit a pitch-perfect note as the delivery method for the “Make It Epic” campaign. Combining those assets—which make up the foundation of our live sports fan engagement platform—with thousands of co-branded cheer cards and a seat-upgrade fan promotion boosted the magnitude of the campaign to truly epic levels. As a result, our client bested all in-venue competition in creating “a significant marketing presence,” topping its nearest direct rival by more than a 5-to-1 ratio, according to one postgame study. This was especially significant in a market (a live stadium audience) swelling with five times as many “influentials” as the general population. Additionally, our findings confirmed a greater impact in terms of key associations for our client—including delivering good value and “making it epic”—over that of a control television audience.